Secretary to the Cabinet Jose Rene Almendras talks with fugitive businesswoman Janet Lim-Napoles, husband Jimmy and lawyer Atty. 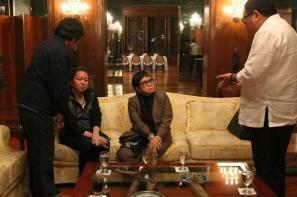 Lorna Kapunan at the President’s Hall Receiving Area of the Malacañan Palace Wednesday night (August 28). The surrender feeler was sent by Atty.